So I turn on my computer this morning, and I find Bitcoin QT has quit of its own accord. I try to turn it back on and I get this message. 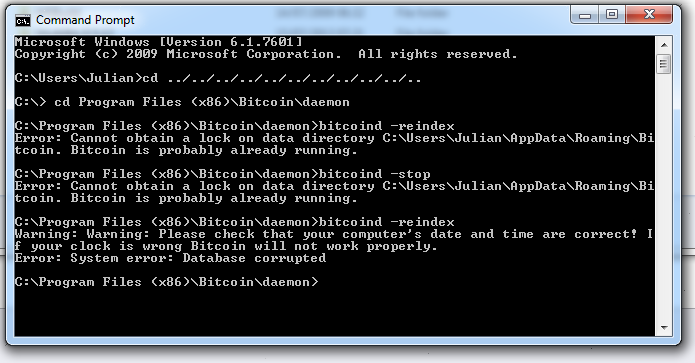 "Bitcoin - Error System error: Database corrupted"
I'm fairly sure Windows 7 restarted itself to install updates. Is this what caused the corruption? Luckily, I have zero bitcoins, and I've reinstalled Bitcoin QT without any problems, but this will stress me out if I want to mine bitcoins while out of town. 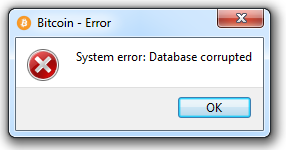 Apparently, if the database is corrupted, you may have lost your wallet and all your money! update Even weirder, I gave the corrupted Bitcoin QT a try and for no reason at all, it started and didn't give me the error. Really scared of loosing all my money. Can someone explain what's happening? Thanks a lot guys. update Nope. 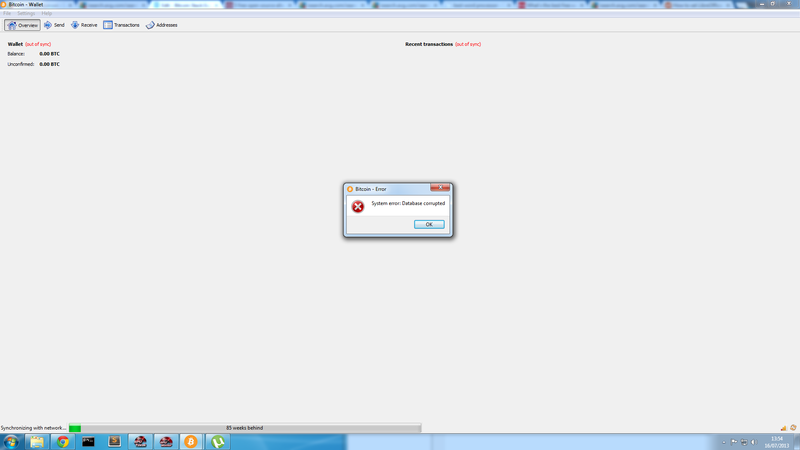 Dispite working, it is still corrupted. It gets stuck on 86 weeks forever. Gentlemen, please help. Logically thinking about it, it must be the same database it's using, that somehow survived the reinstall. Maybe if someone could point me towards where this database is stored so I can delete it manually? Brand new computer, 64 bit genuine windows 7. Barely any programs installed. Can't believe how flaky this open source software is. I think the error is hardware based. Ran memtest86 and found multiple errors in my RAM. Also got a blue screen for the first time last night. Makes sense, sometimes bitcoin qt would run for minutes, other times days. I think it was hitting a bad address at different times. When I quit Bitcoin-Qt manually before shutting down the Mac, then the Database doesn't get corrupted. But it is quite annoying to bear in mind about that every time. Manually reinstalling the Database is possible but you will loose every address. Read here: https://en.bitcoin.it/wiki/Data_directory where to look for the file you need to delete. I didn't try this, since I actually have money stored on my addresses. My RAM is brand new hand has no Errors. If you still have troubles you might think of switching to an online-wallet. You can easily export your address like this: Open Bitcoin-Qt > help > debug window > console > dumpprivkey YOUR_BITCOIN_ADDRESS e.g. : dumpprivkey 1DjEL..... will get you ..VcHHcF... You can then import this "private key" on for example https://blockchain.info/de/wallet/ just by copying the private key into the "import" section. This will work even during the reindexing process. I cannot believe nobody posted the obvious....... please go to your %appdata% folder then roaming. then delete everything but the wallet.file, then and only then, un-install the program and re-install it. i am 99.999999999999999% sure this will solve your problem. i have worked a ton with the QT source code and am quite familiar with it. I suggest you to use Bitcoin qt version 0.8.3, and run it as Administrator. And check whether there are some APP prevent QT to create data on Windows User Files. Have you checked your disc allocation? The entire Bitcoin db is in the neighbourhood of 14gb (as of today, 2/12/2013). I moved the Bitcoin db to a folder on a different partition (with over 100gb of space) and the that resolved the issue for me. The error message isn't very helpful, and neither is Windoze, but in my case the amount of free space on disc appears to have been the issue. Just delete the Blocks folder in %appdata%/bitcoin. You'll have to download again the whole Blocks database but hey, You've got your bitcoins back :D.
Using 0.14 and yes, you can remove the chain and wait for a week to fork it all in, but you stop and start a few times and it is corrupted again. Strange that bitcoin has the strongest development team and this corrupted database can not be easily solved. Just remove everything and start all over again waiting for a week. Where is bitcoin-qt's blockchain stored in Windows 7?